I have decided to put team/manager based analysis on hold for the time being so that I can switch focus to a review of some of the key performance statistics for each major playing position that contributed to points in last season’s premier league. Gavin Fleig has now released ‘tier one’ of the advanced data set, which will no doubt start to divide my attention, but I will stick to posts on the basic data for now. The next few posts will group players by position, and I intend to review correlations of the key fields in the MCFCAnalytics/Opta excel data set to determine their relative contribution to picking up points. The most interesting findings I will share with you on the posts which follow. 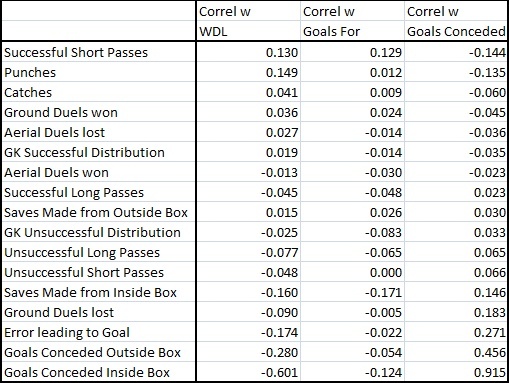 Below is a table of correlations between goalkeepers vs team results. For the WDL correlation I scored wins as +1, draws as +0.5 and losses as 0, following the methodology popularised by Soccernomics. Listed above are some of the key fields that I believe will be useful in appraising goalkeeper performance, at least in the 2011-12 season. However, clearly some of the fields need manipulation before we can look at keeper performance, for example ‘goals conceded inside box’ is always going to be worse for a keeper playing in a team which concedes more than average – but if we use the ratio of saves inside box to goals conceded inside the box we can review which goalkeepers save a higher proportion of shots. Aside from goals conceded in/outside the box, I found errors, ground duels and short passes to be particularly important. I also found a curious (albeit small) correlation between GK long passes and goals conceded: it appears as though the more often a goalkeeper kicks long, the more likely his team are to lose – regardless of whether or not the kicks are successful or unsuccessful. It could be argued that this is largely dependent how how good a team’s defence is at making themselves available for the short pass and may not purely reflect on the keeper. What is beyond doubt is that a significant part of the goalkeeper’s job is in possession/distribution of the ball. Another surprising correlation is the frequency of GK punches to wins. I am still struggling to work out this one! On to the rating. Firstly, I removed any keepers who had played fewer than 1000mins (approx 11 games), leaving 22 players. Then I gave points of 1-22 (1 worst, 22 best) for each key measure and weighted this by correlation to goals conceded. According to my ‘on-the-fly’ system, I can now reveal that Joe Hart was the best goalkeeper last season, closely followed by David de Gea and Michel Vorm. Paul Robinson sits rock bottom, scoring poorly in almost every field except for ground duels. The biggest underperformer, based on team performance, was Arsenal’s Szczesny who finished 17th out of 22. This entry was posted in Uncategorized and tagged Analysis, Football, Goalkeepers, Joe Hart, MCFCAnalytics, Opta, Paul Robinson, performance statistics, Premier League, soccer on September 15, 2012 by thepowerofeleven. 1) Firstly , collect as much of relevant data about players/match/team (statistical data and rankings mainly ) and identify the features that have the most impact on a team winning the match. 2)Secondly , I want to identify patterns in the matches won by a team (say , the home team) and apply pattern mining algorithms like Apriori and see how a team wins matches. Could you guide me as to how to go about it?